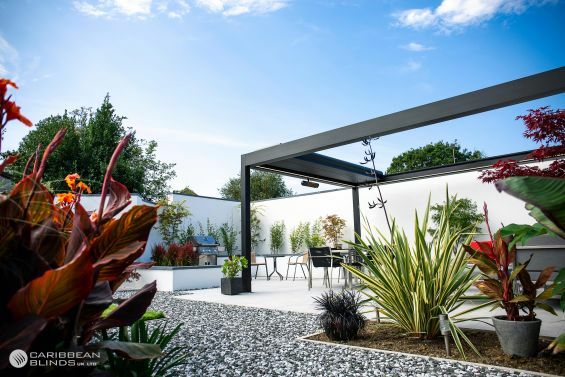 The clients had a vision of creating a garden space that would provide them with the ultimate outdoor living experience and the Prestige Outdoor Living Pod™ had become the focal point to their plans. The white walls combined with the vibrant colours of the specially selected plants have created a sensational backdrop for our louvered roof structure. 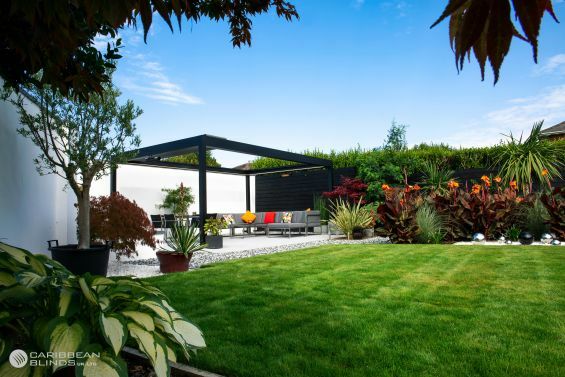 The Prestige Outdoor Living Pod™ was powder coated in a special black colour to stand out against the existing design features of the garden, giving it a dominant and elegant appeal that draws your eye straight away. 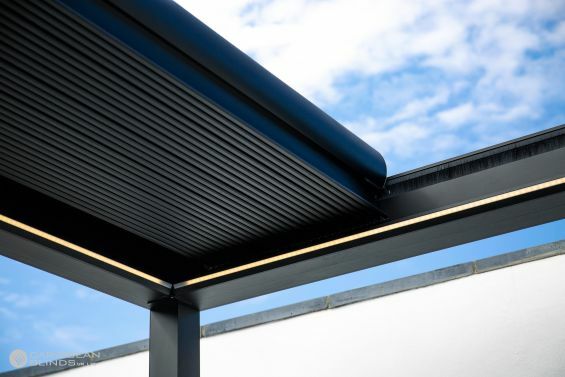 This sliding and rotating roof pergola is the perfect all weather solution for those that are looking to make the most of their external space. The aluminium structure adds a new dimension to the garden that cannot be achieved any other way as it has been engineered to provide sun, shade and shelter at the touch of a button. 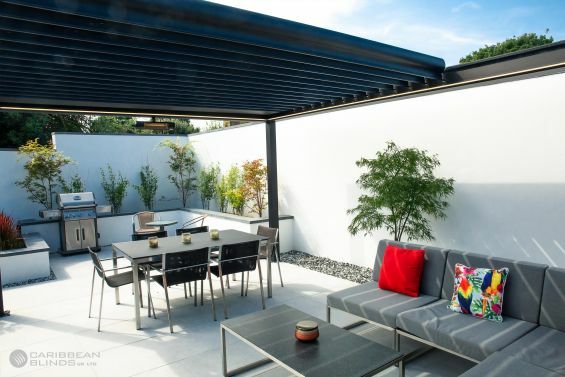 Our clients wanted to create a dedicated outdoor living space that sits away from the home and provide them with a place they can dine and unwind and this bespoke patio canopy stretches a generous 6m x 4m to do just that. On one half of the pergola space you will find cosy corner sofa that has been decorated with soft furnishings that accent the garden planting, drawing colour to the living space. On the other half of the Pod sits the alfresco dining furniture that has been positioned specifically in front of the designated BBQ area. Now they can relax in the sun and dine in the shade with convenience of the Prestige Outdoor Living Pod™ and its innovative features. This was once a garden that consisted of a lot of greenery that engulfed a lot of potential space and limited the clients on how they used their garden. With a vision in mind and careful planning they were able to create a harmonised space that lifted the barriers and unlocked the garden they desired. You too can do the same, with the Outdoor Living Pod™ you can make your garden work for you. Contact our team today to discuss your options and create a design that will enhance your lifestyle - 0344 800 1947 or alternatively you can use our quick enquiry form to receive your free detailed product brochure.